This doesn't seem to belong to any particular cuisine - it was probably invented by a pastry manufacturer. It can look very attractive, and is certainly very tasty. Peel and finely chop the onion. Melt a generous lump of butter in a frying pan on medium-low heat. Add the onion and cook, stirring frequently, until soft but not browned. This should take 5-10 minutes. Transfer to a bowl, let them cool down a little, then put in the fridge to cool completely. Wash and finely chop the mushrooms. Add more butter to the frying pan and sauté the mushrooms on low heat until they have released all of their moisture and look quite dry. Transfer to a bowl, let them cool down a little, then put in the fridge to cool completely. Put the minced pork into a bowl and stir in the onions, salt, pepper and sage. If you are using ready-made sausagemeat or meat plucked from sausages, you won't need to add any more seasoning. Preheat your oven to 180°C (356°F) fan, 200°C (392°F) conventional, gas 6. Unroll your pastry - it should be rectangular. If it is interleaved with a sheet of greaseproof paper, keep the pastry on that, otherwise cut your own greaseproof paper and work with the pastry on that - it'll make handling easier later. With the longest edge towards you, spoon the filling mix in a long pile in the middle of the pastry sheet. Try to shape the meat as evenly as you can. Spoon the mushrooms along the top of the meat. With a small sharp knife, cut the sides of pastry into strips about 12mm (half an inch) wide, at a slight angle - about 70° - to the longest edge of the filling. Lift up the first strip onto the top of the filling. Lift the corresponding strip on the other side, and bring it up to meet and slightly overlap the first strip. Do this with all remaining strips, and close the ends with any excess pastry. Paint the finished roll all over with beaten egg. Transfer the roll to a baking sheet. If your pastry came rolled on greaseproof paper, hold the 2 long edges together and lift the roll onto the sheet. Flatten out the edges of the paper. Place in the oven for 30-35 minutes until golden brown. When baked, allow to cool a little, then slide it onto a wire rack. This sausage plait is delicious hot or cold. The video above is from the Keef Cooks YouTube channel. 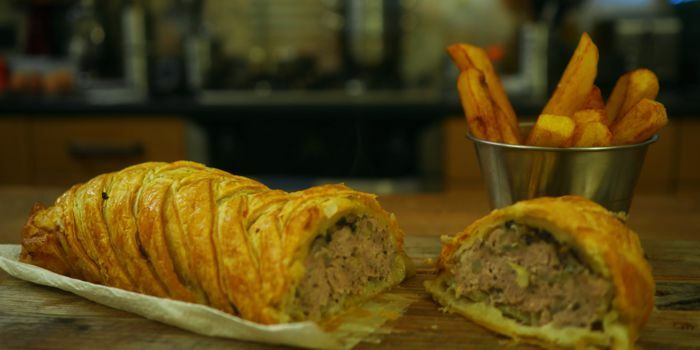 Click here to see the video recipe of Sausage Plait on YouTube. Butter for sautéeing, beaten egg for glaze.